Posted 12/11/2012 When I head down to Big Sur, I'm typically hoping to find some condors to photograph, but as there aren't that many of them left in the world, finding them often proves to be elusive. It was an overcast day and after hanging out at a typically decent condor location for a while with no condors to be seen, attention turns to what else is in the area. You'll frequently see marine life in the ocean below this pullout, usually sea lions and sometimes dolphins and whales depending on the time of year. On this occasion, four pelicans flew by low over the water. The water looked particularly glassy on this day, so I shot some images as they went by thinking that the water looked cool. Later, a humming bird started feeding in the flowers at the edge of the highway pullout and I managed to get some frames of it as it moved from flower to flower. When I got home my first thoughts were to check to see how the humming bird photos came out and I got some good ones. Only later did I check the pelican shots, and as I was going through them I noticed I had a couple where all the birds were gliding (most of the shots, at least one bird was mid flap) and their shadows were very obvious on the glassy water. Only at this time did I realize I had a good image. I grew up with parents who were big Beatles fans, so I'd seen the Abbey Road album cover since I was a young lad. 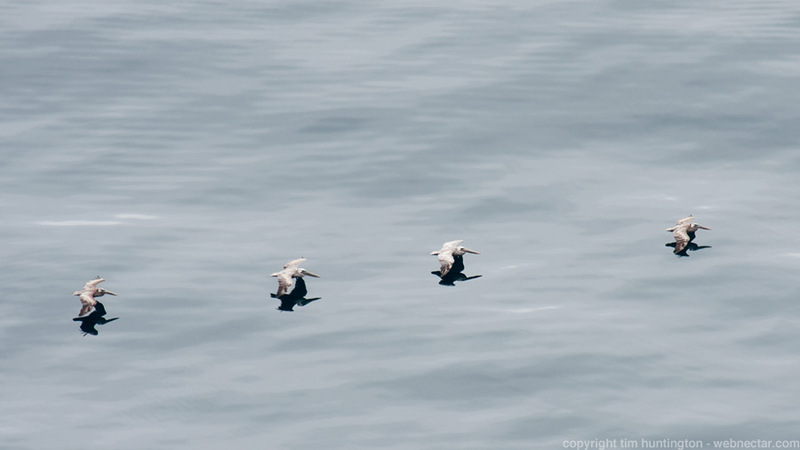 As soon as I saw these four pelicans floating over the ocean on the screen, it reminded me of that album cover and the name for the image was self evident.